Husband J and I have been walking different chunks of the West Orange Trail for about the last year, as memorialized in “A Walk on the West Orange Trail” and “The West Orange Trail – Starting from the Other End.” But we also had an overarching desire to see if we could walk the whole thing in one fell swoop – well, at least 20 of its 22 miles. 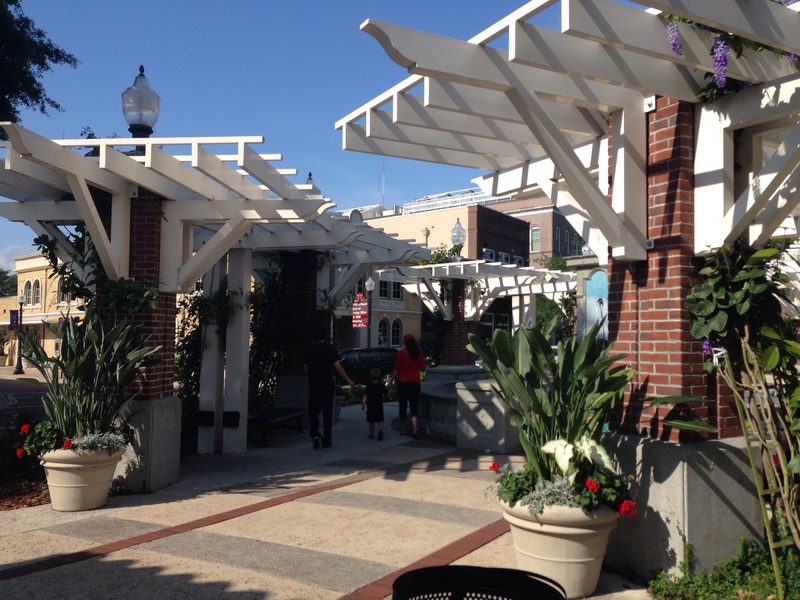 (The very last couple of miles – mostly along the side of a busy street in Apopka and culminating in the middle of a sidewalk in front of a strip mall – are simply not worth including.) After all, we reasoned, if the Romans could march miles like that in one day while laden with armor and the spoils of war, surely we could manage it with hiking boots and backpacks. So, early on Saturday we set out with a couple of friends who had agreed to participate in the initial stages – M, of Iceland fame (see the prior weeks’ Iceland saga), one of my law partners who is affectionately known as King A, his daughter A, and her large, brown brindled part Weimaraner who shall be known by her full name, Daphne. It was a beautiful, if humid, day and the first five miles to Winter Garden were like a walk in a shaded park along oak lined paths. The park theme was particularly evident as we passed a meadow inhabited by ostriches and long horned cattle (or maybe buffalo?) 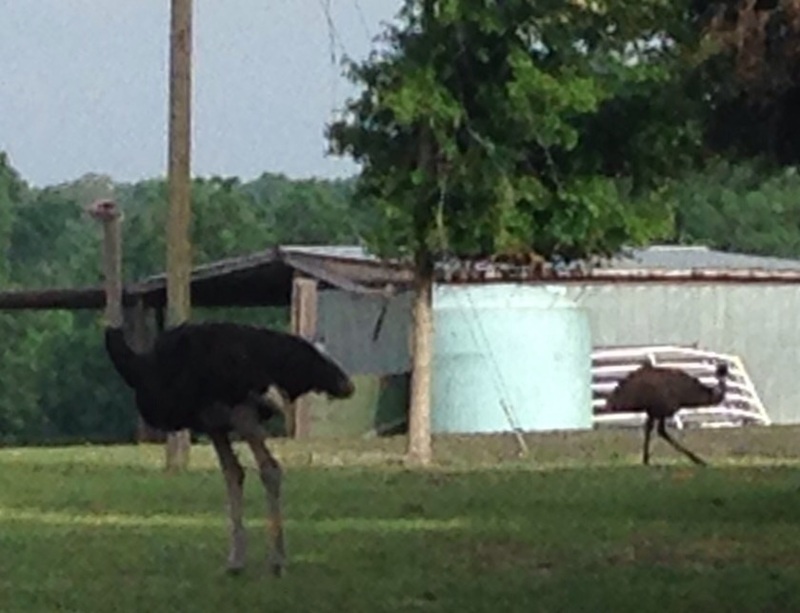 – not what we were expecting amid the Spanish moss. The amount of rapid development along the trail is incredible. In the months since we were last there houses have sprung up like proverbial mushrooms. While many developments are promoting their ecofriendly characteristics, the fact remains that each of them is occupying what used to be open Florida land. Just before mile 5, M abandoned us to return to a more normal day of activities. King A and his daughter left us in the charming town of Winter Garden – after Daphne lay down in the middle of the sidewalk and clearly announced she had had enough. 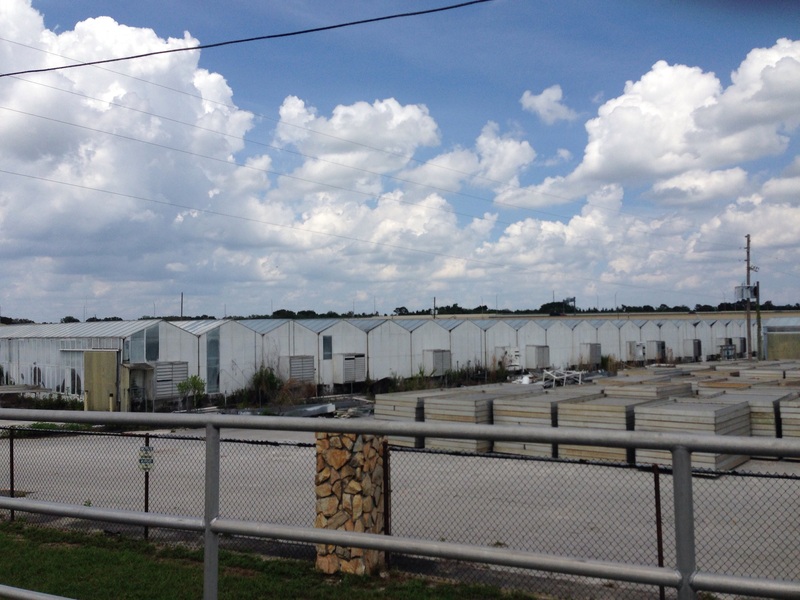 Miles 5 to 10 wind through multiple housing developments and old citrus groves; they pass warehouses and fields, and the site of the Ocoee high school sustainable agriculture program, where three students were tending a cow. Some of the housing developments share great swaths of green semicircular common areas surrounding retention ponds – the manicured grass for all intents and purposes looking like a giant green unibrow. But where were all the people? It was as sterile as a glossy page from a magazine. 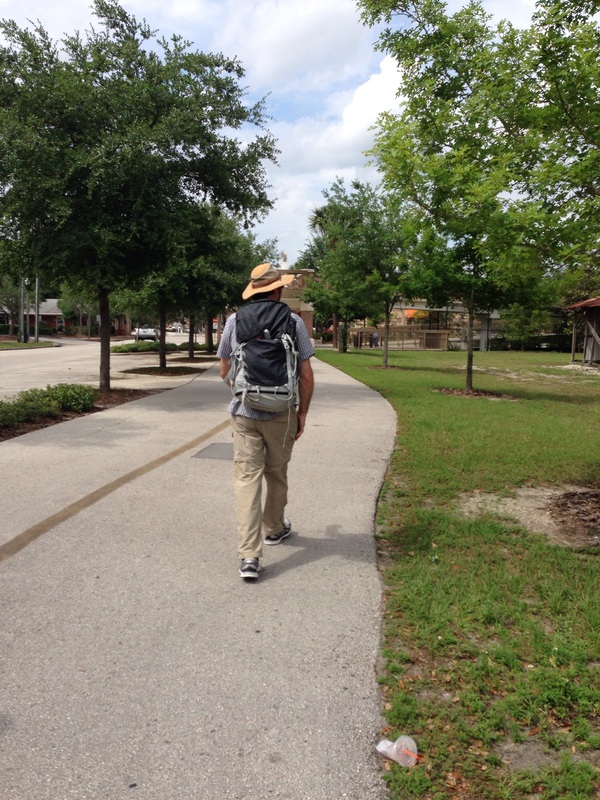 When we walked through some much poorer areas later on the outskirts of Apopka there were men outside sitting on lawn chairs, kids playing with hoses, people walking down the trail to actually get somewhere. 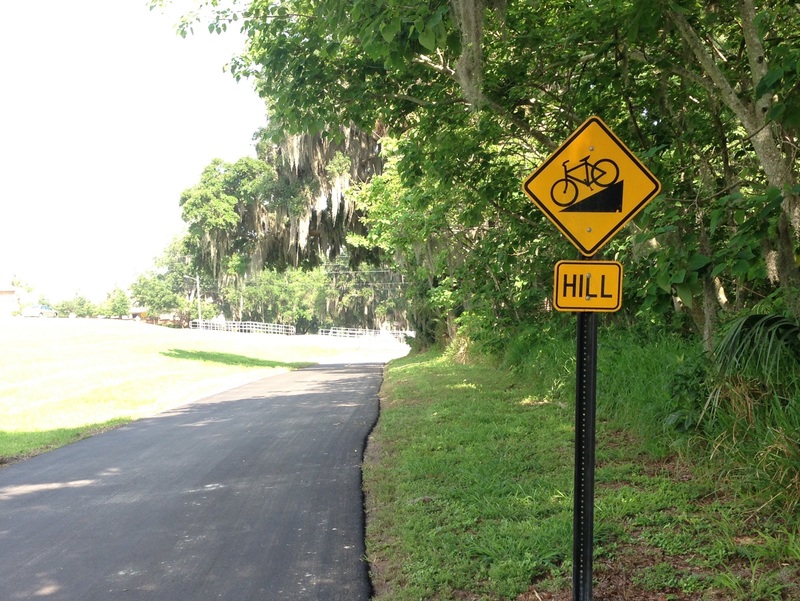 Only in Florida – hill warning with no discernible hill in sight! At just after mile 10, we decided it was time for lunch and eventually located a bench in the shade of a freeway overpass, with a golf course running along one side. I had started off in running shoes, believing their light weight would help with the distance but had packed my boots just in case. By mile 10 it was clear it was time to shift footwear. So after a sandwich break and foot ministrations, we set off for the final 10. Things, as they are wont to do, got even stranger during the last half of the hike. As we neared the end of the seemingly interminable golf course, lining the other side of the trail was a field dotted with bright flowers – which after a few moments we realized was a memorial garden. We had been thrown off by the office building – a small frame house with a filled in swimming pool. Huh? And I’m not sure what the proximity of the memorial garden to the golf course says about the nature of human existence but it doubtless means something. 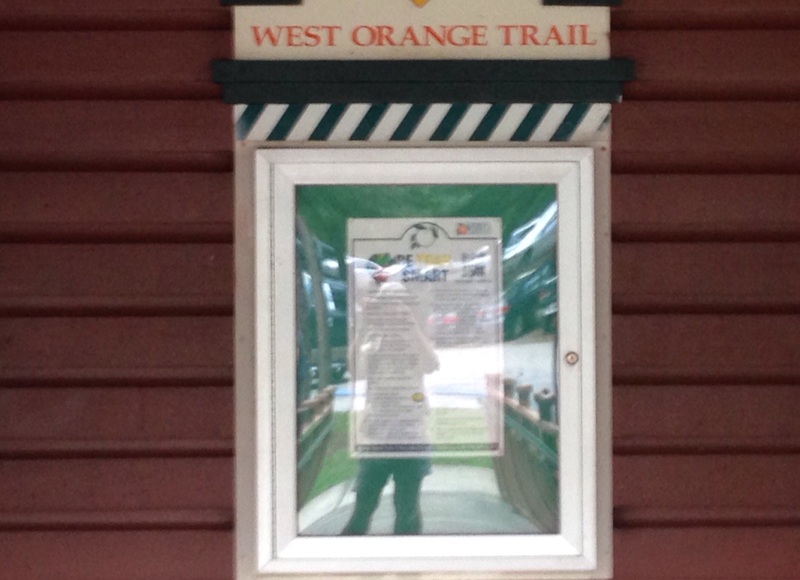 We also concluded that Apopka must be slightly higher than Oakland, at the beginning of the trail – although there were no real hills, we kept going up a steady slight incline – and never seemed to get to go down. When we reached mile 15 we had travelled more miles than on any previous hikes, and we were also on a part of the trail we hadn’t seen before. All of a sudden, peering over the edge of the trail was a giant white statue of Buddha gazing down serenely on the cyclists whizzing by him – it turned out we were next to an extremely large and ornate Buddhist temple. The religious juxtapositions were interesting. We had started by the “Mosaic Church” near Oakland, now the Buddhist temple, and shortly after encountered churches ranging from the Seventh Day Adventists (where a very dressed up congregation was just departing church services) to something called St. Elizabeth, a Church of God By Faith, with no other apparent denominational affiliation. After a wooded section we emerged onto another road which offered a tour of Apopka’s dying foliage industry. Nelson’s Florida Roses (I had never realized it was even in Apopka) still seemed to be flourishing – although we couldn’t help but note that when we saw them switch on the sprinklers the electrical transformer over our heads actually crackled and sparked. But next to Nelson’s are acres of semi-abandoned greenhouses, giving a sort of post apocalyptic feel to the whole place. 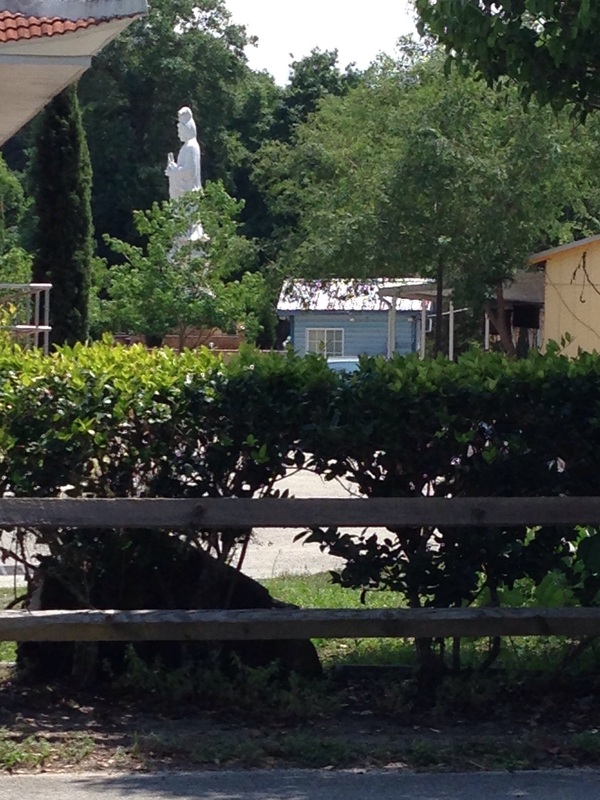 Finally we made our way through a wooded area, dotted with small houses, and up to the Apopka bridge. Just beyond that is the Apopka Station, our ending point, but we were just under miIe 20. So we forced ourselves to go on just a little further so that when we turned around back to the Apopka Station we stopped at mile 20 on the nose. This particular training adventure, unlike most, was a one way trip. Except for the half mile at the end, when our friends A and T retrieved us, we hadn’t covered any of the same ground twice. Sometimes I wish summits were like that – you could get to the top, just stay there, and not have to come down again.